I find as women grow into their full characters (and sometimes fuller bodies), they can carry larger rings. 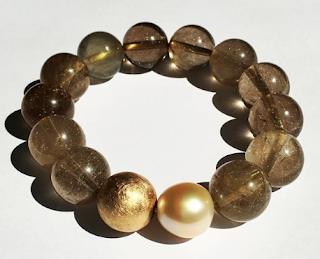 You don't need to be statuesque, merely, as Oprah–no stranger to the jewelry department–once said, "able to inhabit your space in the world". Nor do you have to enjoy cocktails, or wear the ring solely for that purpose. (The alternative terms "big ring" or "dinner ring" attempt to dispel the notion.) The cocktail ring is uncompromisingly present, but asserts that presence discreetly or with full symphonic accompaniment. Many women avoid big rings thinking size is proportional to cost. I've selected choices below the stratospheric pricetags of haute joillerie–even some faux–because you don't want your cocktail ring to drive you to drink! You don't need to wear a cocktail dress with your ring; each would look chic with your favourite black turtleneck and jeans. 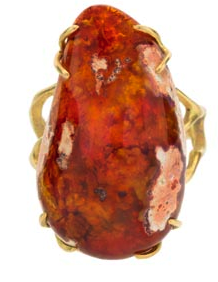 A big juicy Mexican fire opal in an 18k branch setting, by Annette Ferdinandsen. The opal flashes orange, pink and rust, and is 1 1/8 inches long. 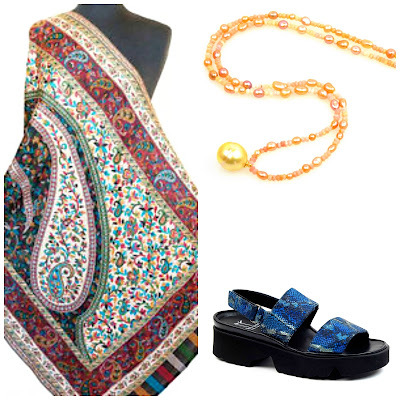 Fire opals are magnificent gems, and you get a lot of stone for your jewelry dollar. This one is $1,590 from Twist. 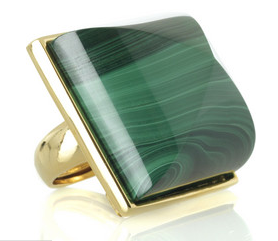 Malachite is another fabulous material for a cocktail ring; it has drama and intense colour; I admire the undulating curve of Kara Ross's malachite and 14k-plated piece. On sale for $210 at Netaporter. Now here is a cocktail ring that says martini, with its mid-century vibe and sophisticated sapphire and pearl dome design. 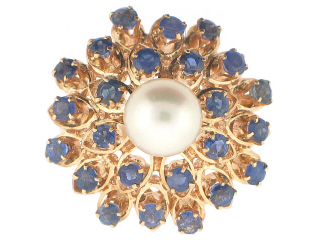 With 1.80 cts of sparkling sapphires and a 7mm pearl, a lot of ring-a-ding-ding, baby girl. Price, $695 from BeladoraII. The story goes that Lauren Bacall grabbed Liz Taylor's hand to admire her huge ring. "Richard Burton?" Bacall asked. "Ken Lane!" replied Taylor, and they both collapsed in laughter. 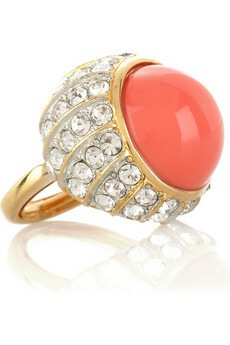 You can wave your hand around in Kenneth Lane's faux coral and diamond ring, on sale at Netaporter for $50. For your jewelry edification, here's the real deal, a ca. 1960 coral and diamond stunner by Van Cleef & Arpels; price, $16,000 from 1st Dibs seller erstwhile jewelry company. Because cocktail rings set in silver are more casual, might we call them beer rings? They will take you from day into informal evening wear. I'd wear this silver Cloud Princess pearl cocktail ring from Balinese designer Kadek Wijanegara, just $48 (plus shipping) from Novica. Very John Hardy at a much lower price. Etsy seller figistanbul's Tamildu ring is a fantasy creation of enamel, jade and cz set in gold-washed bronze set on an ornate silver shank, drama galore for $99. A big faceted aquamarine (13mm x 14.5mm) set in an 18k bezel on a silver band is a best-of-both worlds ring, simple yet substantial. A good choice for the woman who, like many of my friends, favours simplicity but now wants pieces with more strength, less sweetness. Price, $205 from Etsy seller JanishJewels. Go ahead, try some on! 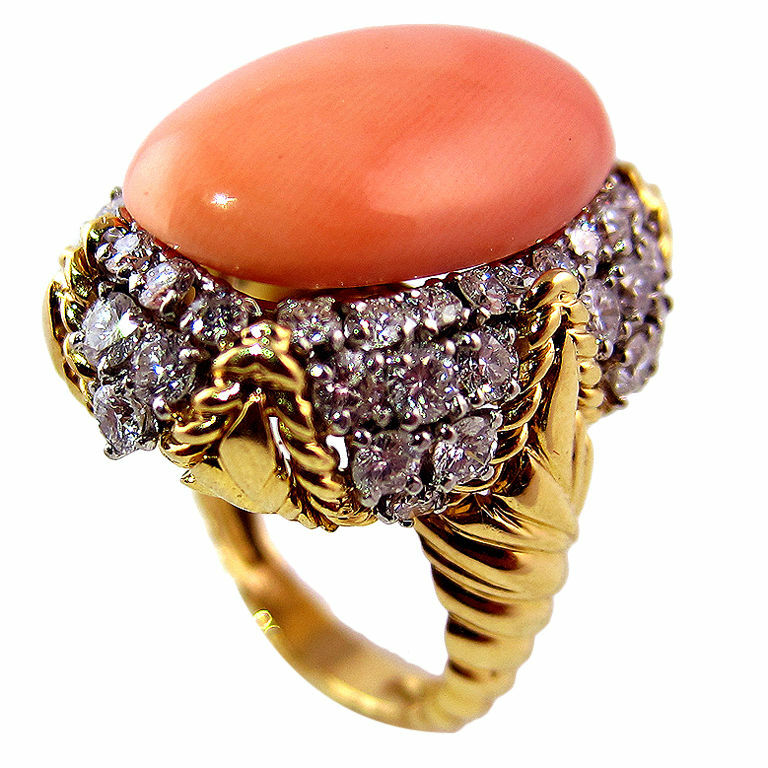 A big ring puts pink in your cheeks, a sparkle in your eye. Whether you wear yours for cocktails or chicken wings, here's looking at you, kid! My first thought was 'Cocktail rings? No Way'. No parties in my life and besides I'm too short for that much ring. However, what you say makes sense. I'm not a beer drinker anymore, but I can relate to "beer rings" ;) Perhaps having a Starbucks in a black turtleneck with that silver Cloud Princess pearl ring on my hand is in my future! I have short, stubby fingers too, so passing on big rings. Not bitching about my hands - I write and paint; think of them as useful more than aesthetic. Now earrings: those are essential. I like the silver ring too, Northroom. Wine rings - and espresso rings - refer more to marks left on tabletops. 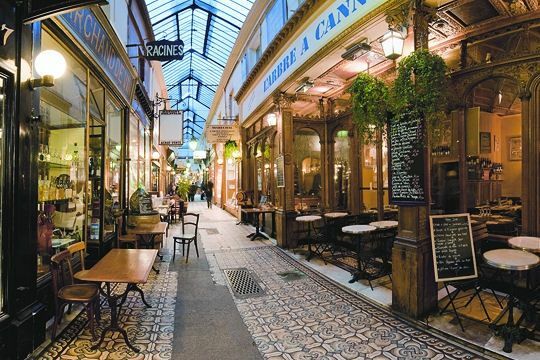 No Starbucks for me - I live in my city's Little Italy (la Petite Italie) so I can get far better coffee cheaper and with less hype. In any case, better cocktail rings than carcinogenic nail treatments, such as UV nail dryers. I dislike health scares, but there is suprisingly little oversight of such cosmetic procedures, for clients and especially staff. I don't currently have a big ring--but you have convinced me that I should definitely have one. In addition to being of a certain age, I'm tall, have big hands--and would enjoy a big ring. I think I just may have some hidden away somewhere. I'll have to give a look. My fingers (like lagatta's) are a little on the sort, stubby side. But I should revisit this possibility. You've certainbly shown some beauties here! I love big rings but I have so much trouble finding ones that fit! Most start at size 5 which is too big for my ring finger. I guess I could wear one on another finger, but they never feel comfortable that way. lagatta: I don't think finger length rules our all large rings (Elizabeth Taylor is petite and voluptuous, and does not have a long hand, for example.) The extremely oversized ring will not suit but a smaller version would. I recently met my 5', chubby (her description of herself) Egyptian friend Anita for coffee. A. has short fingers, legs and waist. Cloud of salt/pepper curly hair. She was wearing three very large (nearly to her knuckle) silver rings. Looked great. Susan: Average to big hands can wear the largest rings. Have fun looking! General comment: I really dislike bitsy jewelry on grown women. Sometimes I see someone well-dressed but their jewelery is too small and girlish. Pseu: One of the tings I notice when in Paris is how many women are wearing big rings by day. I love it. Nancy: Rings can be sized. And rings made to order such as the Etsy option can be ordered in your size. My daughter bought some huge rings at Forever21! Around $5. Junky but fun.I was thinking of getting one myself, but I never remove all the small-real--rings that belonged to my grandmother and great aunt. I don't suppose I could mix big and little? Thank you for this post - I have a slowly growing of what I call "power rings" since I neither drink cocktails nor do I generally dress up for dinner. I'm 5'-4" and my hands are not large, but if I wear a larger ring on my index or middle fingers, I've felt they balance better visually. With tailored clothing often all I need for style impact is a splash of color from a scarf and one of my power rings. I bought a stocking-stuffer ring for my daughter this Christmas at a local jewelry boutique: acorn-sized, entirely made of faceted, cloudy glass, jade green. She loved it. I couldn't get the cerulean blue version out of my head (a delicious blue, like old French opaline glass) so I went back to the store after the new year and bought it for myself. Can't fit a glove over it, but it does make me smile, and I can't wait to wear it in the sun. Oh--and the price? About $12. I love big rings especially if they are Retro or Modernist in style. I think that a big ring is very chic. As I've gotten more mature, I've discovered I can carry off some of my larger pieces without apology or feeling as though I'm impersonating someone. (My leather-pants wearing grandma? Probably--she had such impeccable style.) I've come into my own, and I have several such cocktail rings. One diamond-and-sapphire number I purchased years ago when I got a huge promotion. It was a "yay me" purchase, but definitely too large for my everyday stature at the time. I wear it to work these days. Another is a tahitian pearl and diamond in a very modern setting. That one still comes out only for fancy dinners, but it makes me drool when I see it. Jewelry is one of my favorite things... my anniversary was monday and DH surprised me with gorgeous emerald earrings, the quality of which made me think they must be Russian Diopside when I first saw them. He gave me a very disapproving look, so I revised my impression, and happily sported them Tuesday AM. Oh, and I have a super emerald cut aquamarine and tanzanite ring that I got for a milestone birthday. That one is on my finger today. It makes me happy whenever I look down! A few years ago my dad and stepmom gave me HUGE turquoise ring for my birthday. 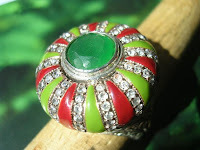 It's a very unusual stone, with white matrix, and everytime I wear it, I get lots of oohs and aahs. One of those items I can't do. I get too startled when my hand passes my face. When I was engaged, I couldn't even get a diamond ring - again, too prone to startling. But I love the IDEA of being an older woman with style, wearing large rings, in multiples, on my fingers. In my next life, in my next life. frugal: "Junky and fun"- but is it you? By now you know my mantra: After 50, wear real. (Silver is far preferable to fake gold.) A friend bought a big carnelian and silver ring at a thrift sale for $15! Yes, you can mix big and little. 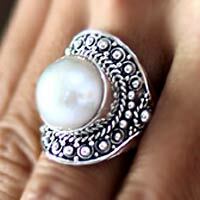 Or take the stones from many small rings and have them restyled into one larger piece. HB: Really cool jewelry, thanks for link! And in Taiwan! Hope reader demi-pointe, looking for a pendant, sees this. Good point, a big ring really lifts a simple ensemble. spacegeek: What a thrilling gift- you will wear with delight, and often. And your other pieces sound mouthwatering, would love to see that pearl and diamond piece, sigh. Rubi: Big turquoise is like a swimming pool on your finger in the depths of winter. What a beauty. The startle effect wanes with wear. Some of the Beladora pieces you borrowed prove that you wear bigger pieces beautifully! Not a far stretch from those earrings to a cocktail ring, heh heh. Belle: I'm fond of retro too. You always have magnificent examples; anyone thinking of a big ring should check your sites first. Some are very reasonably priced. Well, I'm barely 5'1" and *I* don't have any problem wearing big rings! How curious that there's a whole chorus of judgment on whether smaller people can wear big rings...they're RINGS for goodness' sake, not 6 foot long sweaters or something! These are all gorgeous pieces Duchesse. One of my favorite dinner rings though is a mid-century dome of big orange aurora borealis rhinestones that I got at a flea market for $4! When I bought it I was about 35, and I wore it then too. Inspiring! 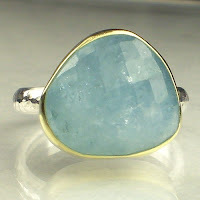 I love the simple aquamarine. LOVE this topic, Duchesse! I love all kinds of jewellery, but especially rings and cuff bracelets for the very reason you identified: the pleasure they give me as I go about my daily tasks! I have also always preferred larger, striking pieces of jewellery; as I have blossomed over the years, however (over 50 now! ), I have felt that a full grown woman deserves a "full grown ring". Have sat across the table at meetings from older, more powerful women than I; the delicate little pieces they've worn since their teens seem incongruous to me. As always, however, this is definitely a matter of personal taste -- and I do love your taste, Duchesse! I have come to love big rings and now have several, most of which are not particularly expensive and I love some of your selections here. I think I was always attracted more to statement jewelry and when I was young I didn't wear much jewelry because it seemed to "grown up". I guess I've grown into it somewhat. Coincidentally, I am wearing a cocktail ring today - not to cocktails, but to work. It is a vintage dome of 6 round white pearls surrounding one slightly larger center pearl, with teeny tiny sapphires in between, set in 14K gold. I love it and althoguh is is as wide as my finger (slightly wider, actually) and sticks up a bit it does not feel too fancy for work. I have been noticing and admiring it all day as I type away on my spreadsheets - and that's possibly better than wearing it to cocktails! I also have a big, big sterling silver ring shaped into a rose. I bought it on the street on vacation in Santa Barbara and I wore it nearly every day all summer. I'm 5'10" and agree with you that bitsy jewelry is not the thing for our height. 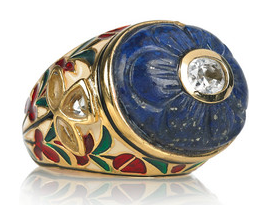 This ring is even more special because my grandmother gave my mom three small diamonds - chips, really - that my mother added to the opal cocktail ring. For the past few years, in honor of mothers, October, and anniversaries, I've swapped my opal engagement ring for the large opal cocktail ring. I tell people I've "supersized" for the month. This entry makes me aware that perhaps it's time to wear the ring more often. I worry about the ring cracking, but it must be 35 years old and is in fine shape. I like rings and have quite a few both large and small. My dilema is "aging hands". I have those brown ages spots and one thumb with clear signs of arthritis. I hate to give up my rings but calling attention to my hands doesn't seem the right way to go either. I do think a larger, simpler ring/stone works best now tho. darla: I'd wear *even bigger* rings, to celebrate the hands that have done so many marvelous things throughout your life. Wearing no rings is not going to change your hands, but wearing big rings makes life more fun.